Owning a dog that loves to dig and scratch carpets may be very frustrating and expensive due to the amount of damage that may result from such behavior. Knowing the underlying cause of such behavior may be a good start. 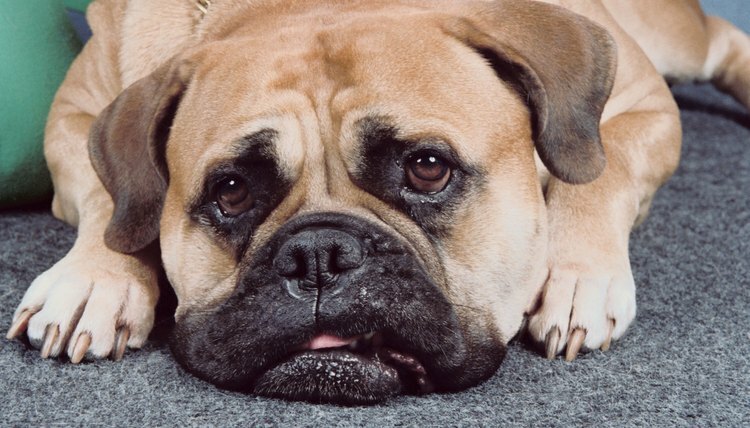 Dogs may dig at carpets out of boredom, frustration, anxiety or mere fun. As much as seeing a carpet shred into pieces may sound like bad news, the good news is that there are many effective strategies that may diminish and even stop such behavior. Start out by fitting on your dog both leash and collar and getting your dog out for a walk. A long walk will get rid of excess energy and the dog once home will very likely settle down for a nap. If the dog is still exuberant, it may be necessary to walk your dog twice a day. Shorten the dog's nails with the nail trimmer. This will allow less damage to occur in case the dog scratches the carpet and may reduce digging behaviors. Make sure to not cut the nails too short or the quick will bleed. If you feel uncomfortable doing this, a dog groomer or a vet's office will also trim nails for a fee. Redirect any attempt to dig in the carpet using a toy. A sharp ''No'' or other loud sound should stop the dog in its tracks and then a filled Kong should be offered as a reward for stopping. A Kong is a hollow toy found in major pet stores which allows owners to strategically fill up with peanut butter, cream cheese or other goodies. Purchase an inexpensive rug and give it to a dog that likes to dig before laying down. Many dogs engage in ''nest building'' behaviors where they scratch before going around in circles and laying down. The rug should be placed in the dog's favorite resting area and should prevent the carpet from being damaged. Place the dog in the crate when the dog cannot be supervised. Many dogs know how to ignore the carpet when in the owner's presence, but will dig and scratch as soon as the owner leaves. Some dogs in particular, will scratch and dig at carpets because they become anxious when left alone. Digging is an instinctive behavior in dogs and is not purposely done to make owners angry. Providing a dog with a sandbox full of sand may be a great gift for a dog that loves to dig. Timing is of the essence: always correct and reward immediately after the act. Never hit your dog for digging and scratching your carpet. Do not scold your dog for having ruined the carpet minutes hours later. He will not understand. How Deep Should a Pet Grave Be?